The Return of Doctor X begins as a more mundane mystery, as a reporter publishes an account of the death of actress Angela Merrova–who shows up alive and threatens to sue the paper, leading to the reporter’s firing. Unable to believe that the dead woman is alive, he investigates and finds a connection between the returned actress and a Dr. Francis Flegg — an expert of rare blood types, and the friend behind the revival of both the actress and the murderous Dr. X. 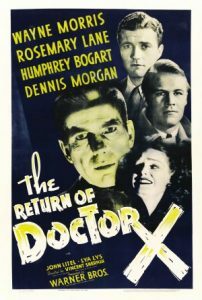 The Return of Doctor X is a very unusual Humphrey Bogart movie — nearly unique. In a role that would have been better suited for Boris Karloff (who was originally planned for the role), Humphrey Bogart plays Dr. Maurice Xavier, an unscrupulous doctor who has been revived from the dead by a treatment by his colleague that depends on an artificial blood. The artificial blood, in turn, depends on a rare human blood type; and the unscrupulous Dr. X(avier) tracks down and murders people with that rare blood type, to maintain his blood supply and stave off his second death. If you’re a fan of old-time monster movies or a fan of Humphrey Bogart, you’ll likely enjoy this, otherwise, feel free to pass on by. The Return of Doctor X (1939) is more of a curio than a full-fledged horror movie, as it has Humphrey Bogart, resplendent in a Bride of Frankenstein hairstreak, in a rare supernatural outing. Detective Roy Kincaid: What is this Group 1, Group 4 business? Dr. Mike Rhodes: Well, you see, medical science has discovered that human blood is divided into four different groups, #1 being the most rare and #4 the most common. We must see to it that certain of these types are not mixed in the transfusion. Detective Roy Kincaid: Then would you say that whoever came into Rodgers’ room to kill him was looking for #1 blood? Dr. Mike Rhodes: It’s possible. That’s why I think the coroner made a mistake in his report, so do you mind if I make a test of these stains for myself? Detective Roy Kincaid: No, go ahead, Doc. 1,2,4,7,11 – it doesn’t matter to me. All I know is this poor guy’s number was up! Walter ‘Wichita’ Garrett: Maybe she’s not dead. Editor: If she’s not dead, they’re playing a dirty trick on her because they’re taking her over to Bixby’s Undertaking Parlor. Walter ‘Wichita’ Garrett’ Garrett: Yes, sir! Editor: [angrily] And don’t come back! Walter ‘Wichita’ Garrett’ Garrett: [to Rhodes] I won’t believe she’s dead ’til I see it with my own eyes. Even then I won’t believe it! Walter ‘Wichita’ Garrett: Well, I hope to see you again sometime. Undertaker: I’m sure you will! Dr. Francis Flegg: Interesting stuff, blood. Boris Karloff was to star as Dr. X.